We have a host of amazing staff, including animal keepers. 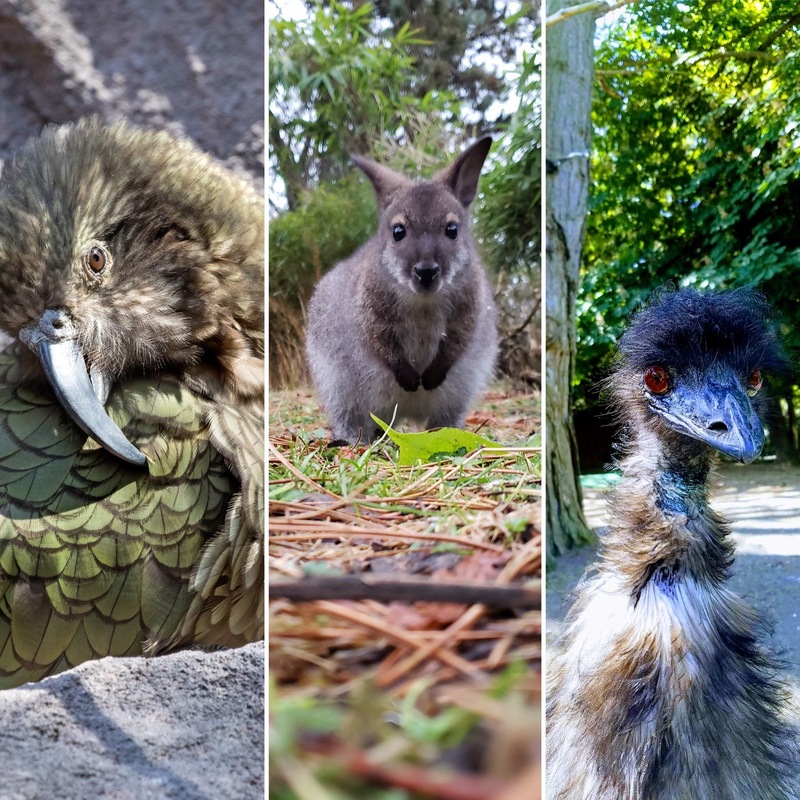 Our Keeper Spotlight series aims to highlight their work and their passion for saving species as well as getting our readers an insider view of what it might be like to work at Woodland Park Zoo. Hello! My name is Amanda and I work as an animal keeper at Woodland Park Zoo. I currently work with tree kangaroos, wallaroos, wallabies, emus, kea, kookaburra, masked lapwing, wonga pigeons, blue-faced honeyeaters. But in the past I’ve worked with everything from big cats to primates, grizzly bears to reptiles! Today I am going to show you around my day-to-day a bit and how I work with our tree kangaroos. Amanda poses with a snack of fresh veggies for the tree kangaroos. This is their indoor space, behind the scenes. I earned my Bachelor of Science in Biology and then started my animal keeping experience at Chahinkapa Zoo in Wahpeton, North Dakota, but I have been an animal keeper at Woodland Park Zoo since 2017. There are so many things I love about my job! Probably one of the coolest things is seeing someone’s face when I tell them a fact about an animal that they just didn’t know before. I remember going to the zoo as a kid and my mind would go wild learning about all the awesome adaptations that different animals have. It's really fun to pass that on to guests visiting the zoo. I love working with our tree kangaroos. Ecki is brave like his mom, Elanna, and is a yam lover like his dad, Rocket. Since Ecki was born, we have been monitoring both him and Elanna very closely. She contributes in her own care and allows us to do a voluntary pouch check. This is a very important behavior because it allows us to see inside the pouch so we can see, initially, if she gave birth as well as all of the developmental milestones of the joey along the way. We were doing pouch checks on Elanna several days a week so we could see things like: nursing, Ecki’s eyes opening, nail and fur development, and all sorts of milestones of joey development that happens in the pouch. We also kept a daily record of different things we saw including the first time we saw body parts sticking out of the pouch, the first time he was all the way out of the pouch, play behavior, and eating solid foods. The first thing we saw sticking out of Elanna’s pouch was his tail! When we saw his head pop out for the first time about 10 days later, he still looked pink and he was almost furless (he was about 5 ½ months old). When Ecki was about 6 months old, he made an appearance fully outside of the pouch for the first time! He made very short trips outside of the pouch while gaining more and more confidence with each trip. When he wanted to get back inside, he just made a somersault back in head first! This is the first time I have had the privilege of working with tree kangaroos. I’ve learned so much about them and instantly fell in love with the species. I have always loved macropods, but had never had the opportunity to work with tree kangaroos until working here. Ecki is so fun to work with! He is starting to gain confidence every day. It has been so awesome watching him learn how to navigate his world of branches and grow his climbing skills to the max! He was a bit wobbly at first but he has definitely gotten his “tree legs.” It is a full body experience when trying to eat produce; he sways back and forth until he is the master of the produce! One of my favorite moments was when he took a yam from us for the first time. You could see the cogs in his mind working, and watch the curiosity take over to make the leap to get his favorite snack. Now he is a pro and doesn’t let a lot hold him back! Elanna is such a great mom, so our job caring for Ecki has been really easy! We make sure he is hitting his developmental milestones and keeps thriving within mom’s care, but otherwise, we let her do her thing! Since he has started eating solid foods, we have been getting him comfortable with us and giving him his favorite food item (yam) so he learns to trust us just like he trusts Elanna. We allow him to participate in training if he wants to when we work with Elanna. So far, he has been just watching from a distance. As far as diets go, tree kangaroos are folivores (leaf eaters). They eat a variety of types of browse, eating not only the leaves, but the bark, flowers, and berries. We prepare things like romaine, kale, spinach, carrot, corn on the cob, banana (the greener the better!) bok choy, and even hard-boiled egg! (Although tree kangaroos are folivores, in the wild they have been seen eating eggs, so cool! Our roos’ favorite items are: dandelion greens, yam, and hard-boiled egg. I knew since I was a young child that I wanted to work with animals in some capacity. I started off thinking I wanted to go into veterinary medicine, but by the end of high school, I realized that what I really wanted to do was be a zoo keeper. It combined multiple aspects of animal science that I loved including things like conservation and animal behavior. Getting to spread the message about this species and the Tree Kangaroo Conservation Program is something pretty special. 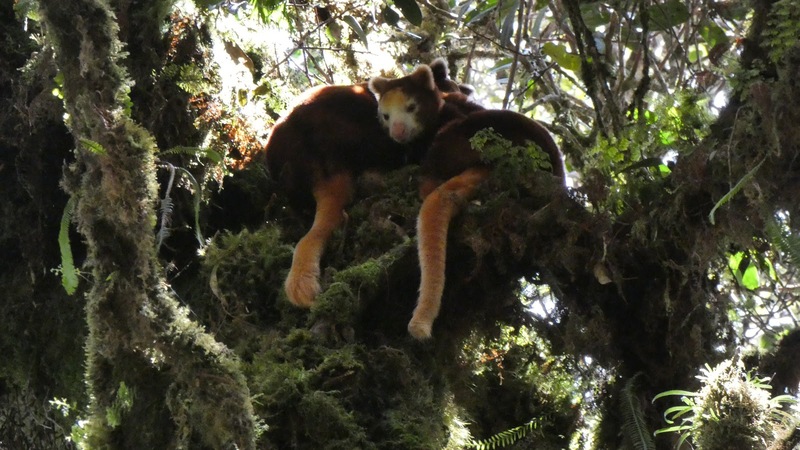 Tree kangaroos are not as well known by the general public as some of the more popular macropods, so it is cool to share information about them and the conservation program that was started right here! I see my role as a keeper as a voice for the animals both here and in the wild. Just a little spark can go a long way in people’s willingness to make an effort in conservation. I believe that sharing my passion for animals can inspire others in the community to help however they are able. In working with the tree kangaroos Amanda is collecting data on tree roos that assists with the work of the TKCP in the wild. She also has a lot of opportunities to share her work with donors and guests and educate them on how our management of different species contributes to field work. Tree kangaroos hang out in the moss-covered canopy in Papua New Guinea. My typical day starts out with getting the diets ready to feed all the animals. This includes: keas, wallabies/wallaroos, honeyeaters, kookaburra, wonga pigeons, and masked lapwings. After the diets are ready to go, it is time to feed! Once everyone has some food, I clean the kea exhibit and kookaburra and other birds’ exhibit. After all this, it is time for tree roos, so I make my way to another part of the zoo to give them their breakfast and clean their home as well. After spending quality time checking on them, and squee—ing over Ecki, I come back to Australasia to get the rest of the daily chores done. 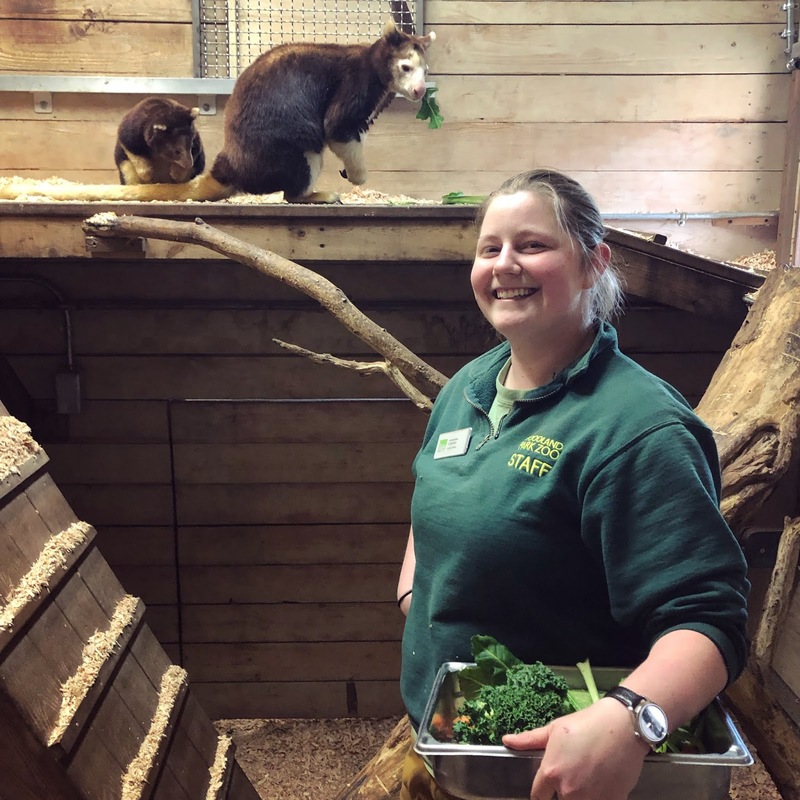 When the end of the day rolls around, it is time to give keas access to their inside holding area and to give afternoon produce snacks to the wallaroos and wallabies. Every day they get something different. It rotates between banana (greener the better! ), yam, and apple. Emus also get a head of romaine and a half of an apple (which we serve on orange Frisbees). We use the Frisbees for training purposes during weight checks, tactile work, and even laser therapy! I head back to tree roos for the end of the day feeding and check in. I make sure they are doing well and they have all they will need for overnight. I round out the day with some record keeping and computer work. It is important to keep daily records so that all animal care staff is up to date on what is happening with the animals. This allows us to see trends that may be important to their care. Each day brings on a whole new set of adventures! Although there is a basic routine that we follow, there are a lot of things that come up that can make things a bit more interesting than planned. There could be a sick or injured animal, a wind storm or even a snowpocolypse! There are things we may have to do to keep all the animals comfortable in inclement weather such as maintaining heat in our barns so that the roos and emus don’t get too cold. We also provide misters for the emus so that they can cool down on our really warm days (they LOVE their shower time!). We take weights on a regular basis to make sure everyone is in a healthy condition along with preventative medicine techniques. We also like to have fun with making enrichment for the animals to help show off their natural behaviors. MJ is one of our red-necked wallabies. He was orphaned when he was about 9 months old. His mother became ill and was unfortunately not able to recover so we kept a very close eye on him. He was eating solids already, so we offered him produce, grass, hay, alfalfa, and our roo grain while we monitored his weight to make sure he was growing. He thrived and is now living in our holding yards until he is ready to go to his new home. He was such a trooper through the whole thing and he gained more confidence as the days passed. He was hopping on a scale like a pro so it made our jobs easier to monitor his weight. Windana is our male emu. He is 27 years old! Emus are the second largest bird in the world. They can weigh more than 100 lbs! Male emus actually construct the nest and incubate the eggs once the female lays them. He will sit on them for 8 weeks while the chicks are growing inside their egg homes. During this time, he won’t eat or drink and loses about 1/3 of his body weight! Squint and Mahoihoi are our keas. Mahoihoi is 35 years old and Squint is 53! You can tell them apart by looking at their feathers. Mahoihoi has a little patch of lighter feathers on the left side of his breast, where Squint has all of the darker green feathers. Keas are known for being SUPER smart! They have been seen tearing the rubber seal out of the wind shield on cars in New Zealand. There are also sightings of them moving orange traffic cones all around the streets. They were almost eradicated in NZ. They would eat the fat off of the backs of sheep and end up killing them. This didn’t sit well with sheep farmers, so keas were hunted in hopes to save their sheep. Between the 1860’s and 1970’s there had been an estimated 150,000 keas killed! There is thought to be only around 5,000 left in the wild, making them an endangered species. Organizations like the Kea Conservation Trust are working towards education and conservation to save the wild kea. We try to provide all the animals at the zoo with choice. Just like for humans, there are a lot of choices that animals have to make in their lives. Choice to hunt, graze, nap, run, cool off, warm up, just to name a few. Some things we provide our animals at Australasia is the choice to be outside or inside, the opportunity to cool down with misters on a hot day, and different spaces to either be away from others or all together. Choice is just one of the ways we can provide animal welfare to the critters living here. We also provide choice when it comes to our training sessions. Elanna always has the choice of whether to participate or not and can move back to her perch if she isn’t in the mood. Tree kangaroos are most comfortable up high in the trees. They don’t go to the ground very often. We try to mimic their natural environment by giving them lots of options of branches at different levels. Ours spend a lot of their time on their benches that we provide and love to traverse the different levels of branch work throughout their environment. Our tree roos have participated in testing new GPS collars that are now being used by Lisa Dabek and her crew at TKCP in PNG. These collars collect data on not only home ranges, but how they use their vertical space in the trees. They are able to tell the altitude at which the tree roos are at any given point, so cool! Woodland Park Zoo staff photo of 2018! One thing that is prevalent in zoos all across the board is that zoo keepers are some of the most passionate people that I know. I haven’t met a keeper that hasn’t lit up talking about their animals or jumped at an opportunity to make their lives better. This is a very unique career and not meant for everyone, but those who are in it are really in it. It is a lot of hard work, it can be both physically and emotionally taxing at times, but every second is worth the moments of pure joy that you get from this career. So many keepers are involved in conservation work inside and outside of the zoo which is so cool! I love coming to work and being around like-minded people who, like me, want to do their very best for these animals—both the ones that live here at the zoo and the ones out in the wild. I love so much about my job, it is so hard to pick just one thing! I really enjoy being able to see animals do what they are built to do, naturally. Mothers doing a great job at rearing their offspring without any help from us or animals foraging for browse! It is amazing to see some of the instinctual behaviors and learned behaviors that animals share and pass on. It is one thing to read or watch something about animal behavior, but it is a whole other thing to see it in action! I also love coming up with ways to enrich the daily lives of the animals to allow them to display their natural behaviors. We have to get creative to introduce enrichment for each individual animal. See you next time you visit the zoo! Mount Rainier peeks across the treetops. Photo by John Westrock via Flickr. I am one of the roughly 10,000 people who moved to the Seattle area in 2018. Like most of those ten thousand-plus, I was drawn by the unique quality of life found here—the combination of a burgeoning economy bringing unparalleled opportunity, and the extraordinary bounty of nature found within easy reach of even city dwellers. Seattle sunset. Photo by Maciek Lulko via Flickr. What I was astonished to discover is that the incredible spread of nature’s palette across Washington was much greater than I first realized. Just within western Washington it includes the huge sweep of the Olympic and Cascade mountain ranges, rising to snow-capped peaks and covered in thick forests of giant conifers and a moss-wrapped elfin understory; and the expansive salt waters and coastal wetlands of Puget Sound and the fresh waters of Lake Washington and the many rivers that run from the mountain to the sound. 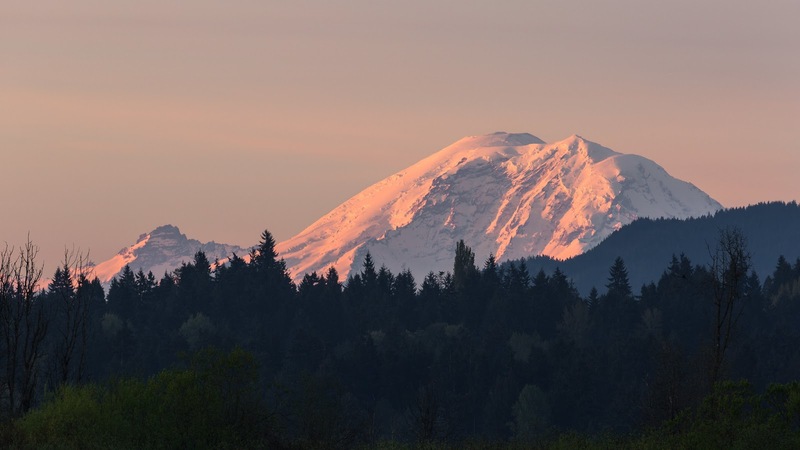 I had heard of these pieces of Washington’s natural splendor—and like so many, for me they were a big part of the draw that makes Seattle the fastest-growing urban area in America—but I hadn’t fully appreciated their true extent. Creek in the Quinault Rain Forest, Olympic National Park. Photo by Nagarajan Kanna via Flickr. 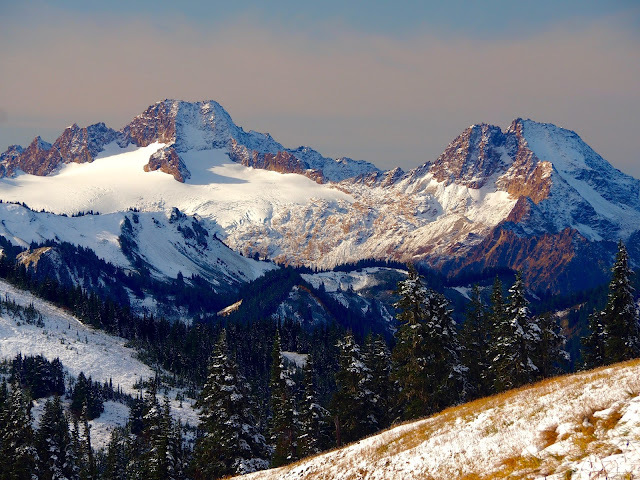 For example, did you know that North Cascades National Park has the greatest number of glaciers of any location in the US outside of Alaska? Or that there are nearly 1,000 square kilometers of old-growth forest just within that one park? Or that the state has over 30 different designated Wilderness Areas totaling over 4.5 million acres of pristine landscape, protected in perpetuity? These enormous expanses of intact wilderness are more than just a set of impressive facts and figures. Just a few hundred years ago most of the continent was one great wilderness from the Pacific to the Atlantic. Over the centuries those wild lands have been cut, carved, dismantled and built over until only pockets remain, dotted across our continent. First winter coat on Twin Sisters Mountain in the Cascades. Photo by jaisril via Flickr. However, here in Washington we still have great swaths of intact ecosystems, some that still function as they have for millennia. The glaciers and thick forests are more than beautiful vistas. They provide the clean water that we drink and that help drive the economy, from commercial enterprises to the salmon whose incredible journeys from river to sea and back are intertwined with the history, culture, and ecology of the region. 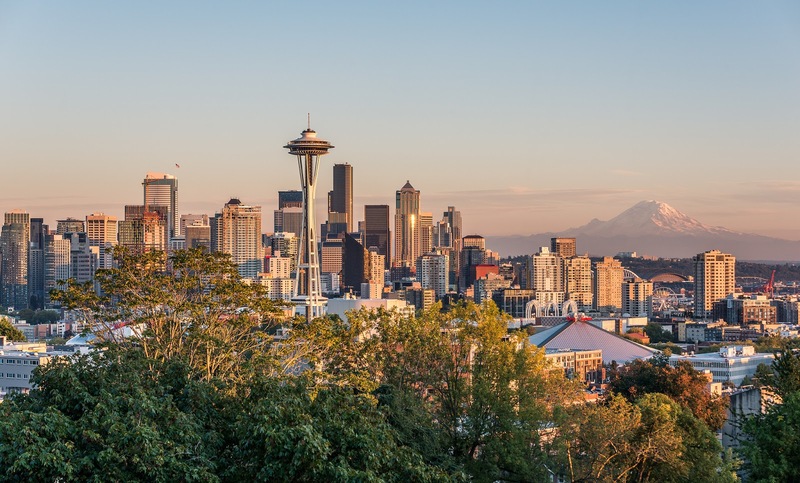 In terms of direct economic benefits, tourism is now the fourth-largest industry in Washington, with outdoor recreation bringing over $20 billion a year to the state. These expansive landscapes draw people, but they also continue to provide a home to virtually the entire suite of wildlife that was here in the Pacific Northwest before Seattle was on any map. Wolverines are rare and iconic flagships of true northern wilderness, dependent on deep snowpack and great trackless areas of the high mountains. Despite being driven to extinction in our state during the last century, they are now making an astounding comeback. So too is the wolf, just a few decades ago only a tale to tell our children and now back from local extinction with 27 packs roaming the greater Cascades region. The corgi-sized fisher, a relative of otters and weasels, is also being rapidly recovered in our forests, and their close kin the cat-sized marten is doing well in the Cascades and may now be coming back in the Olympics. 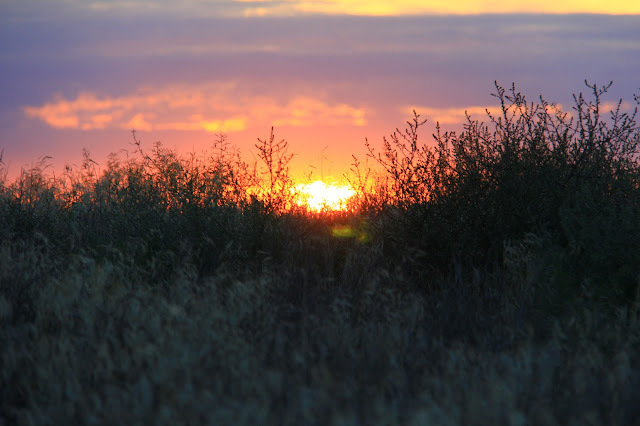 Sun over the Juniper Dunes Wilderness. 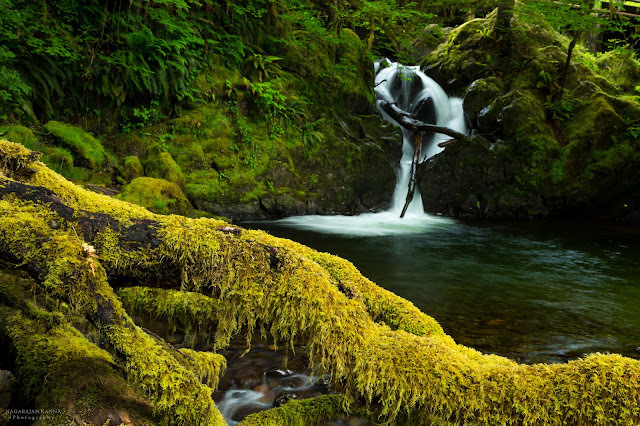 Photo by Bureau of Land Management Oregon and Washington via Flickr. The returning wolf, wolverine, fisher and marten join our state’s black bears, cougars, bobcats, Canada lynx, and coyote, along with moose, elk, mule and white-tailed deer, mountain goat, and bighorn sheep. Only large, healthy landscape can handle this wealth of diversity, and we are lucky enough to live in the middle of this cornucopia of wildlife and the intact ecosystems that support them—and us. 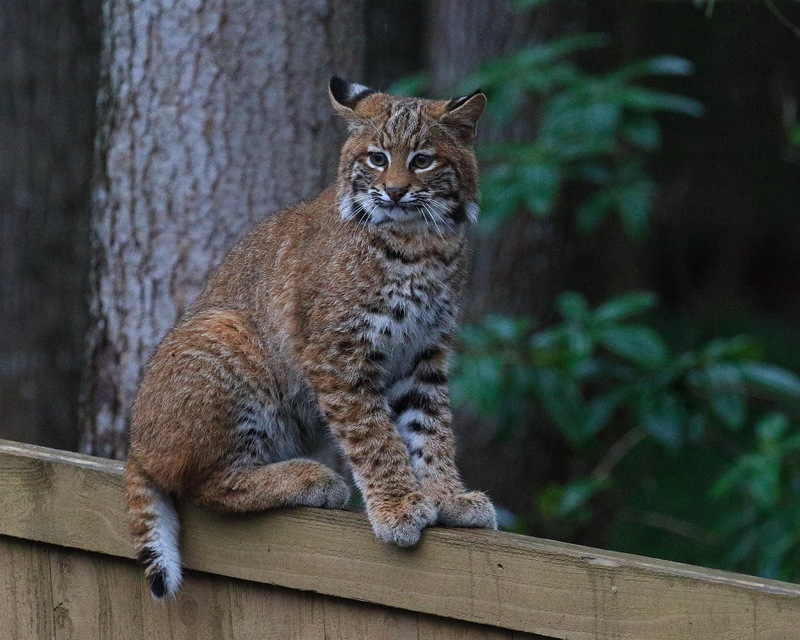 Bobcat in a backyard in King County. Photo by Daniel Toweill via Flickr. 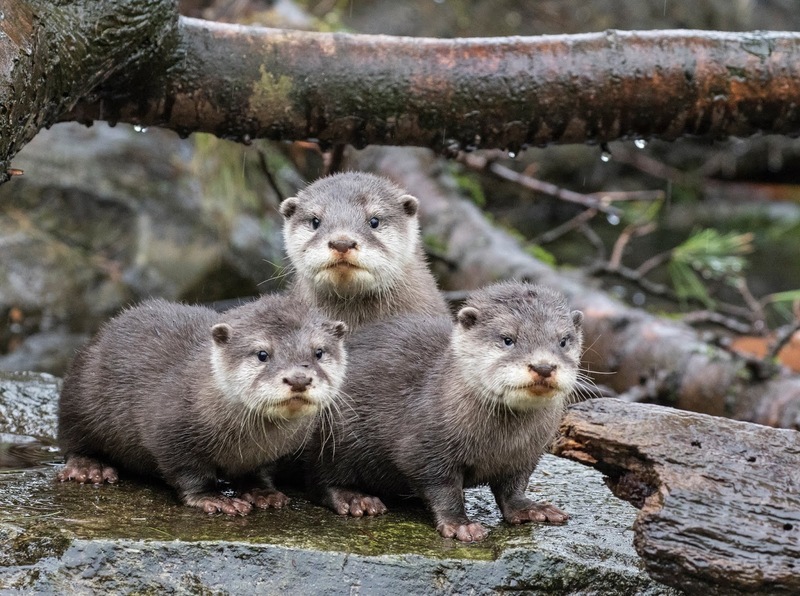 Woodland Park Zoo’s Living Northwest Conservation Program actively works to save wildlife and habitat across Washington. Projects range from monitoring wolverines and lynx in the Cascades and marten in the Olympics to northwestern pond turtle and silverspot butterfly reintroduction and recovery, urban carnivore research in Seattle’s urban and suburban green spaces, citizen science initiatives, and education programs to help people and wildlife coexist. 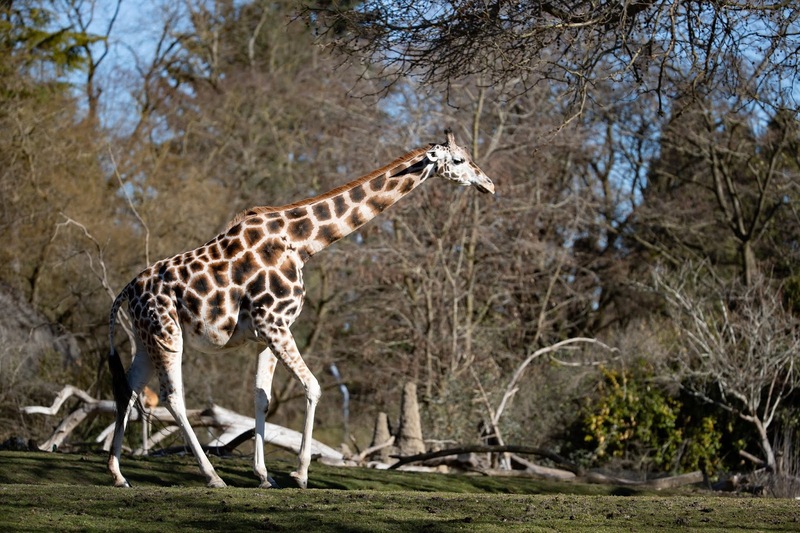 Birth watch begins for pregnant giraffe Olivia! Hey soon-to-be-mama, Olivia! 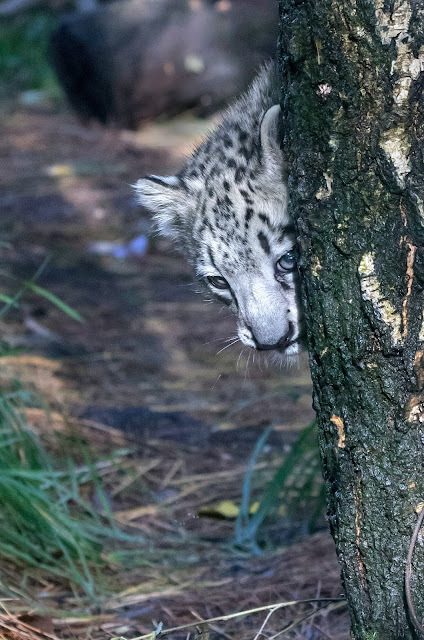 Photo by Jeremy Dywer-Lindgren, Woodland Park Zoo. Our very pregnant giraffe, Olivia, has been put on 24-hour birth watch after showing signs late last week of approaching labor. The birth window began mid-March and extends until the end of April. A pregnant Oliva, right, next to sister Tufani, left. Photo by Jeremy Dywer-Lindgren, Woodland Park Zoo. The zoo’s animal care staff are monitoring Olivia closely at the zoo and several times throughout the night via barn cams. Stay tuned to updates at www.zoo.org/giraffe and follow #HaveYouHerd on the zoo’s Facebook, Instagram and Twitter channels for the latest news! The new baby giraffe will mark the first offspring between 12-year-old Olivia and 6-year-old Dave. Olivia had her first baby, Misawa, in 2013. 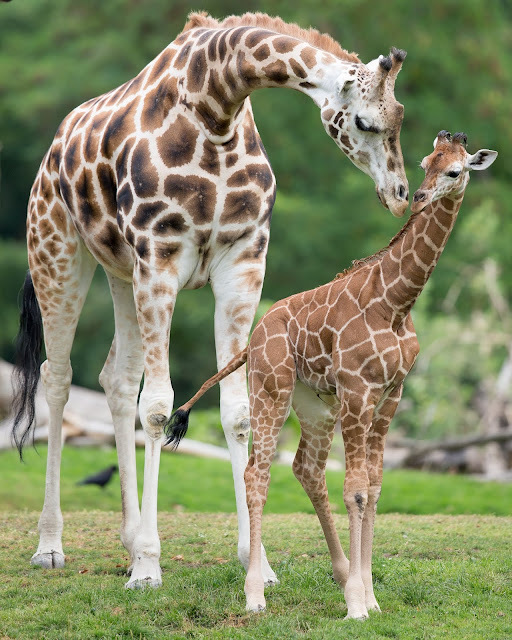 The last giraffe birth at the zoo was Lulu, born in 2017 to mom Tufani—Olivia’s sister—and dad Dave. Olivia, Dave and Tufani make up the current herd of giraffes at the zoo. Olivia, with niece Lulu in 2017. Photo by Jeremy Dywer-Lindgren, Woodland Park Zoo. “The giraffe herd still has access to the vast African Savanna habitat and we’ll assess this schedule daily leading up to the birth. Once signs of labor intensify, we’ll keep all of the giraffes in the barn and outdoor corral so we can more closely monitor any behavioral changes. We’re gearing up for the birth and adding extra bedding to the stalls. We can’t wait, we’re very excited to welcome this new baby!” says Ahl. According to Kim Szawan, an animal care manager at Woodland Park Zoo, giraffes give birth standing up and the calf drops 5 feet to the ground as it is born. Baby giraffes are typically born 6 feet tall and stand within an hour after birth. 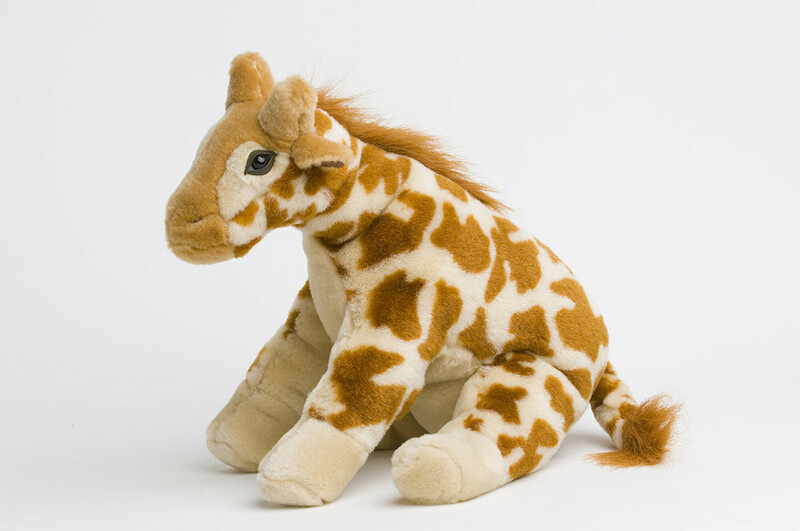 “The first 24 to 72 hours are critical for newborn giraffes. We want to see the infant nursing shortly after birth and running around with mom several hours later,” explains Szawan. When fully grown, giraffes reach a height of 16 feet tall for females and 18 feet tall for males. Oliva on the savanna. Photo by Jeremy Dywer-Lindgren, Woodland Park Zoo. The expectant parents, Olivia and Dave, were paired under a breeding recommendation made by the Giraffe Species Survival Plan, a cooperative, conservation breeding program across accredited zoos to help ensure a healthy, self-sustaining population of giraffes. Woodland Park Zoo participates in 111 Species Survival Plans, overseen by the Association of Zoos & Aquariums. Led by experts in husbandry, nutrition, veterinary care, behavior, and genetics, these plans also involve a variety of other collaborative conservation activities such as research, public education, reintroduction and field projects. 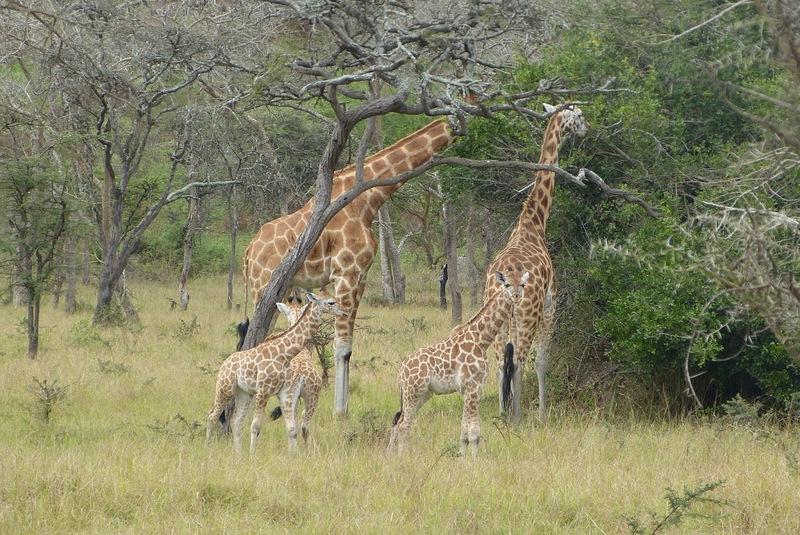 Giraffes are widespread across southern and eastern Africa, with smaller isolated populations in west and central Africa. New population surveys estimate an overall 40 percent decline in the giraffe population; fewer than 100,000 exist today. 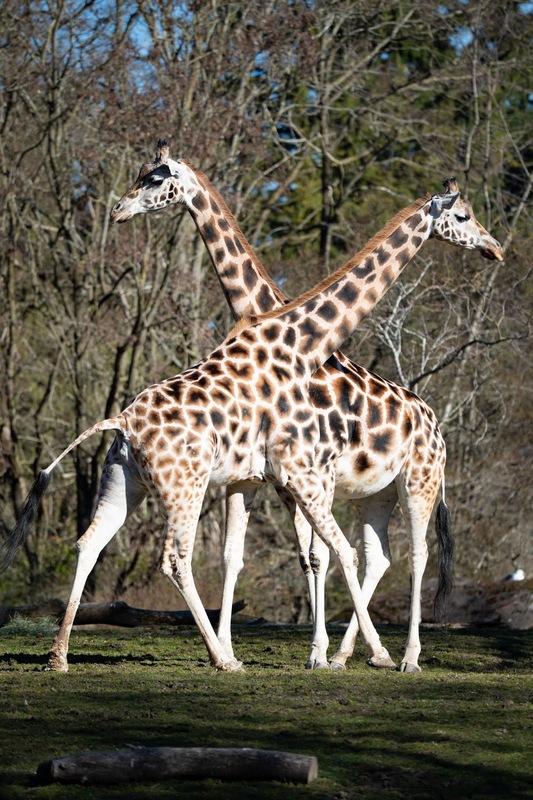 Of the currently recognized subspecies of giraffe, five have decreasing populations, while three are increasing and one is stable. With your support, giraffes like the eight calves who were born in Lake Mburo National Park in Uganda just this last year have a better chance at survival when their habitat is protected. Photo via GCF. 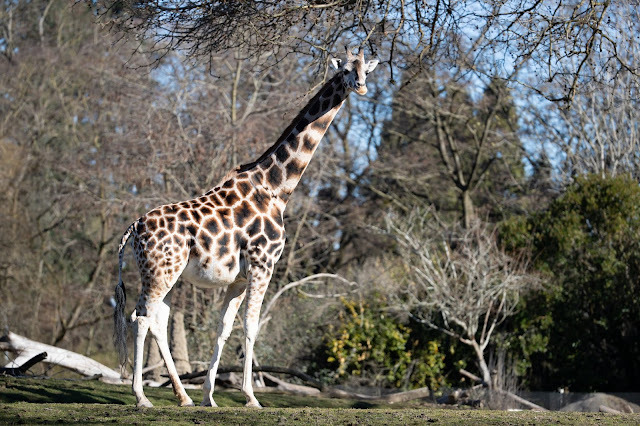 Giraffe enthusiasts can stick their necks out for giraffes and help support conservation efforts by visiting Woodland Park Zoo and supporting the Wildlife Survival Program, which includes the Giraffe Conservation Foundation. The Foundation seeks to provide the first long-term ecological monitoring effort of the Angolan giraffe—an important desert-dwelling giraffe subspecies in north-western Namibia. Visit zoo.org/conservation to learn more about the zoo’s conservation partnerships taking place in the Pacific Northwest and around the world. Adopt a ZooParent giraffe in honor of Olivia and baby. Visit zoo.org/zooparent. National Volunteer Week: We Love Our Volunteers! Woodland Park Zoo saves wildlife and inspires everyone to make conservation a priority in their lives. The ways people take action for conservation range from dropping their “Quarters for Conservation” into our voting kiosks—to helping establish Papua New Guinea’s first conservation area with our Tree Kangaroo Conservation Program. 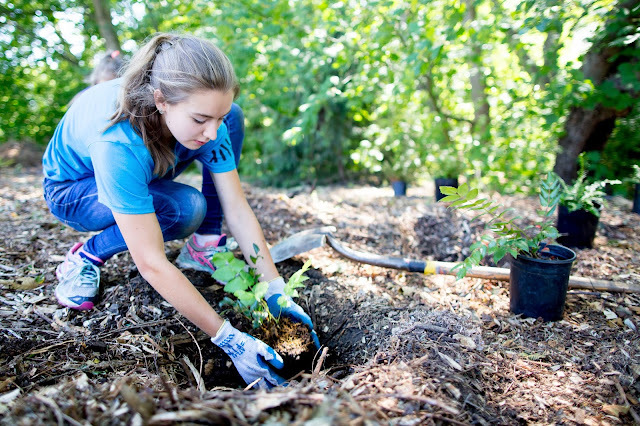 One of the many ways the zoo invites our community to take conservation action is through our robust volunteer program. Volunteers are at the heart of our mission. Zoo volunteers donate over 90,000 hours annually and share a diverse and talented skill set. Our volunteers embody “making conservation a priority.” Each year during National Volunteer Week (April 7 – 13) we celebrate the vibrant community of volunteers that supports Woodland Park Zoo! 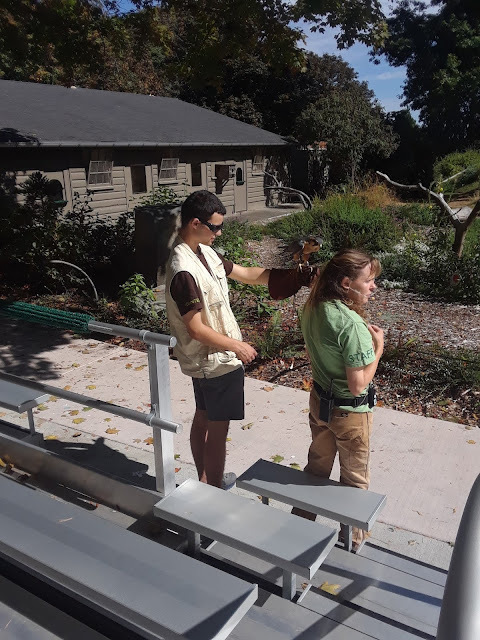 Every year, Woodland Park Zoo volunteers invite new ambassadors into the zoo community and coach them into the invaluable resource you encounter on grounds every day! 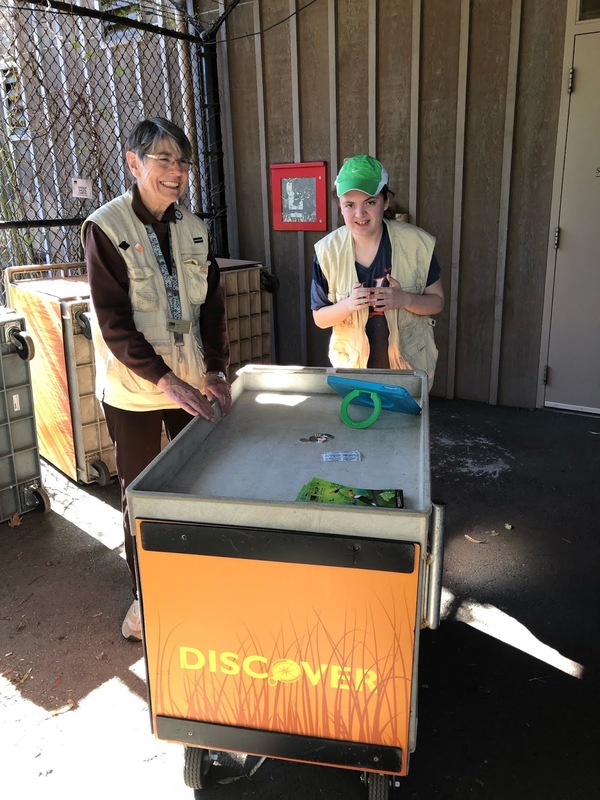 The Woodland Park Zoo volunteer team has opened the door wider—making room for volunteers with all abilities to take action for conservation. The Volunteer Inclusion Program, funded by a two-year grant from the Institute of Museum and Library Services, seeks to support people with disabilities in taking action through volunteering at the zoo. This can mean providing extended training, making physical modifications to tasks, setting up supports within the volunteer community, or making space for non-traditional volunteer roles. “The Volunteer Inclusion Program is another critical step forward to making Woodland Park Zoo a place of inclusion in which people of all backgrounds and abilities feel welcome and inspired to make conservation a priority in their lives. 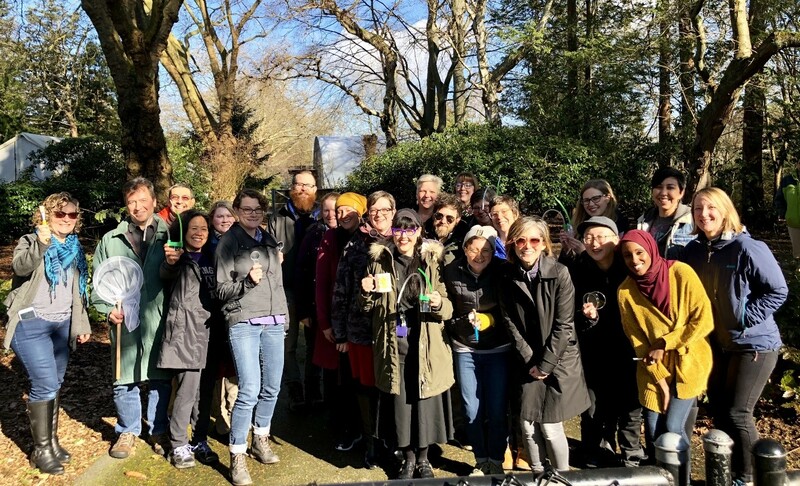 We hope this new component of our diversity and inclusion initiative can become a model for other cultural organizations who also aspire to reduce barriers for participation of all audiences and to expand their volunteer programs,” says Woodland Park Zoo President and CEO Alejandro Grajal, PhD. Morgan and Sue at a Discovery cart. Sam practices holding Lola the Aplomado falcon at the raptor barn with keeper Gretchen. “Not all the time. But you deserve it!” jokes Sam. Volunteers at Woodland Park Zoo are a wealth of resources and contribute greatly to the zoo. The volunteer team, all 800 +, are putting a concentrated effort into developing an inclusive environment. As volunteers, each person is valued for their individual contributions, talents and strengths. We are proud to watch the community grow stronger with the integration of people with diverse abilities. To learn more about volunteer opportunities with the zoo, visit zoo.org/volunteer or email us at volunteer@zoo.org, we'd love to hear from you! More rain forest, more roar! The critically endangered Malayan tiger just got another helping hand from a coalition of wildlife conservation organizations, shining a brighter light of hope for the magnificent big cat. Malaysia’s new Kenyir State Park has just been designated an additional 48,466 acres. Combined with another logging concession protected in May 2018, the new park now spans 74,140 rain forest acres—nearly three times the park’s original size and three times the size of San Francisco. Kenyir State Park is the first-ever state park for the state of Terengganu and the first state park to be gazetted in Peninsular Malaysia since 2007. The Malayan tiger is one of six subspecies of tigers and lives only on the Malay Peninsula and in the southern tip of Thailand. 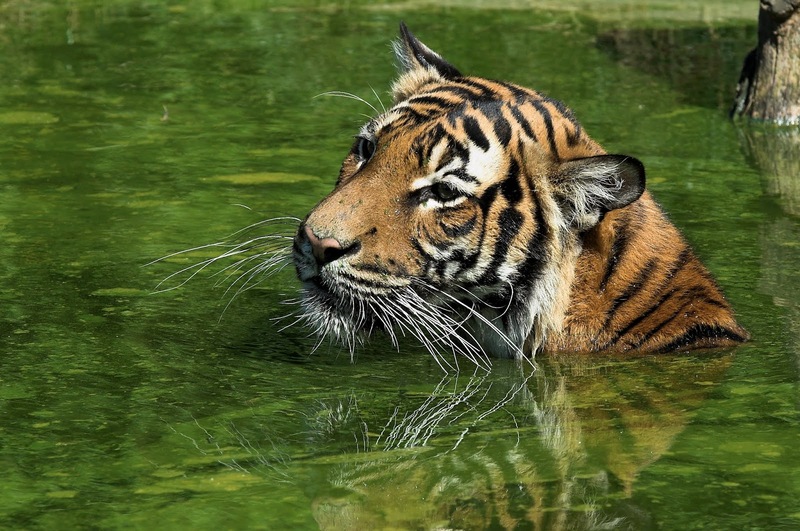 The population for Malayan tigers is dangerously low—fewer than 250 survive in their natural range. They face tremendous pressure from poaching for the illegal wildlife trade and other threats including habitat loss, logging and other human developments. In an effort to save these iconic big cats from extinction, in 2013 Woodland Park Zoo created a partnership with Panthera and Rimba, an in-country field partner of the zoo, to launch the Malayan Tiger Conservation Project. This project is a 10-year initiative with the Terengganu State Government to protect tigers in and around Taman Negara National Park in peninsular Malaysia. Malayan tiger at Woodland Park Zoo. 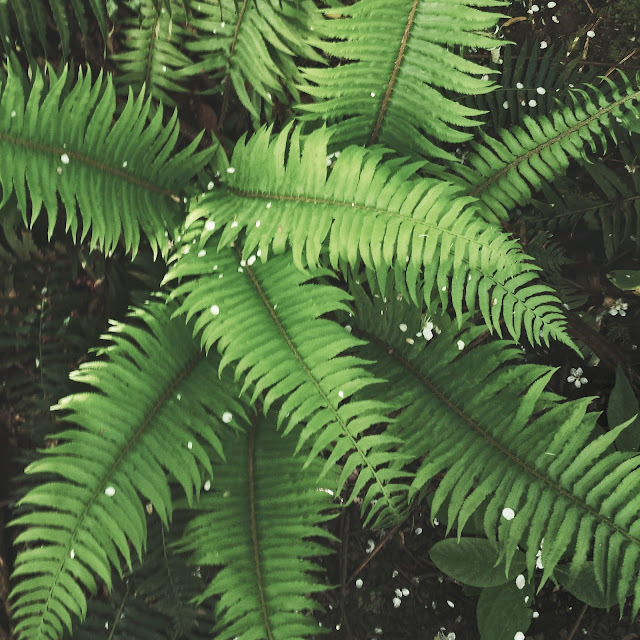 In 2018, with critical support from Rainforest Trust, the program helped establish and then expand Malaysia’s new Kenyir State Park. The park is phase one of a much larger conservation project that will eventually encompass 250,000 acres that lie within a globally important Tiger Conservation Landscape and critical wildlife corridor. 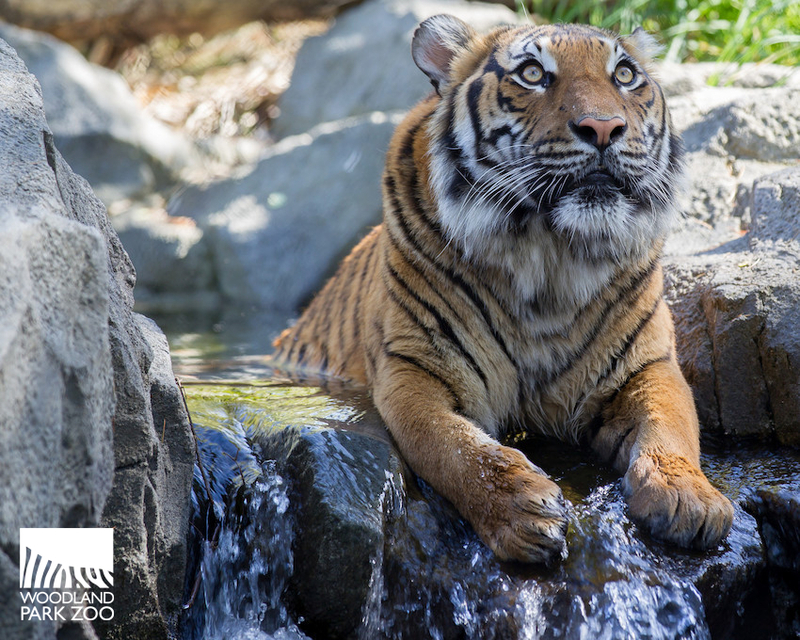 Woodland Park Zoo's Banyan Wilds features Malayan tigers, sloth bears and Asian small-clawed otters. The program and new park also protect the critically endangered Sunda pangolin and endangered Asian elephant, two other species highly threatened due to poaching and habitat loss. 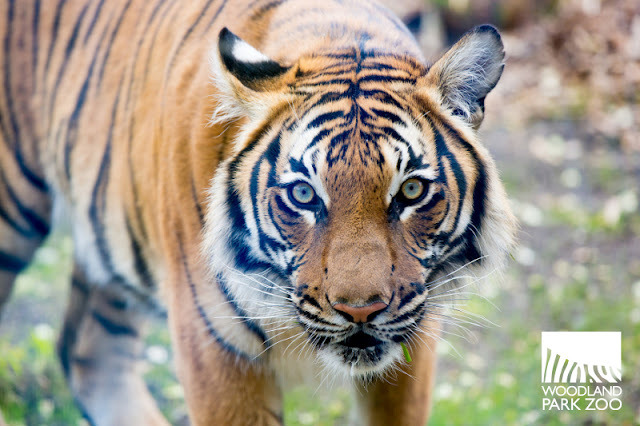 Visit www.zoo.org/tigers to help support the Woodland Park Zoo-Panthera Malayan Tiger Conservation Project. Zoos, science museums, and public libraries all share a common goal: to inspire lifelong learning and curiosity in the world around us. In the spirit of fostering experiential learning across generations and supporting early childhood and youth development, Woodland Park Zoo and The Seattle Public Library are bringing an exciting, new learning opportunity to Seattle-based children and families. In partnership with Science Action Club of the California Academy of Sciences, we are thrilled to offer an adventurous “Bug Safari” curriculum for after-school and summer programming! This summer, the library will be celebrating the 100th anniversary of its Summer of Learning program aimed at reducing summer learning loss through free hands-on programs, reading promotion, and book giveaways. The 2019 theme is “Explore Your World!” and will feature librarian-led Bug Safari programs all over the city. 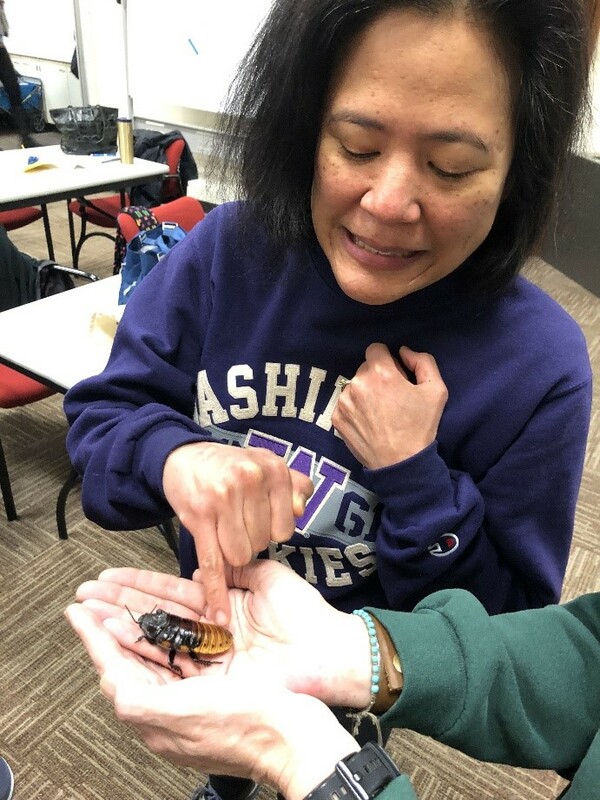 Earlier this year, a team from Woodland Park Zoo (WPZ) facilitated training for almost 50 Seattle Public Library (SPL) children’s and teen librarians on informal activities offered through the Bug Safari module of Science Action Club (SAC). WPZ attended a SAC training course at the California Academyof Sciences in 2016, and over the next couple of years partnered with the National Girls’ Collaborative Project to extend this SAC training to a wide variety of afterschool education providers across the state. 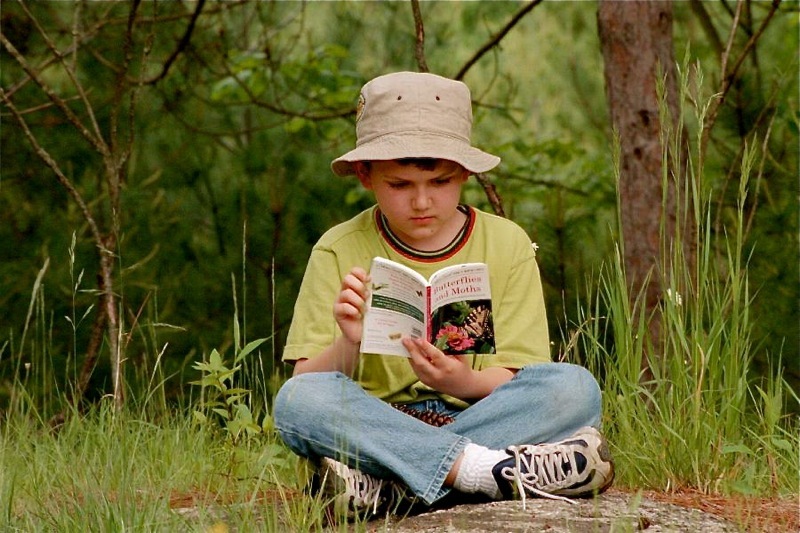 The SAC Bug Safari curriculum prioritizes the same values as the zoo and library in several ways. First, it’s dedicated to providing equitable and inclusive science learning opportunities for children and youth from communities most impacted by economic, racial, and other societal inequities. Each training devotes time for reflecting on and discussing how the Bug Safari modules can be adapted to support the needs of early learners, English language learners, intergenerational groups, youth from diverse cultural backgrounds, and emerging teen leaders. Second, the Bug Safari module capitalizes on a shared value of citizen science by engaging the general public in scientific research and providing people of all ages and backgrounds the opportunity to add their own observations to a growing body of scientific knowledge. Youth learn about the insects that live in their neighborhoods and can upload local observations to the free mobile app iNaturalist, an online community of experts that helps validate species identifications. Finally, Bug Safari fosters empathetic connections —both for animals and for other people. In SAC trainings at Woodland Park Zoo, participants met some of our favorite, awe-inspiring animal ambassadors. Zoo learning facilitators modeled and explained techniques for building empathy for all animals, even those that may not be initial fan-favorites like Madagascar hissing cockroaches. By the end of the session, even participants who had initially hesitated were enjoying becoming acquainted with these charismatic insects. “This training helped expand the capacity of our youth services librarians to facilitate fun, hands-on learning programs and gave us additional tools for summer programming in our branches and through our partnerships with community-based organizations,” says Amy Twito, Informal Learning Program Manager at the Seattle Public Library. 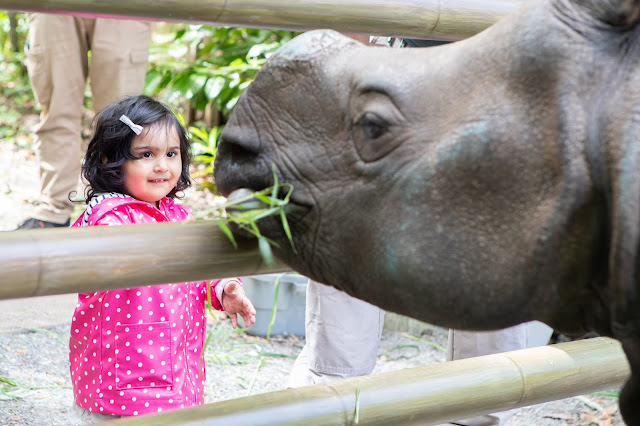 We hope to see you this summer at the Seattle Public Library for a summer of learning focused on exploring your world, or at Woodland Park Zoo for up-close experiences with animals! To get started, stop by your local Seattle Public Library location, www.spl.org, or check out Woodland Park Zoo’s website at www.zoo.org/citizenscience for information on the 2019 City Nature Challenge. More than 150 cities across the globe are participating in this friendly citizen science competition. 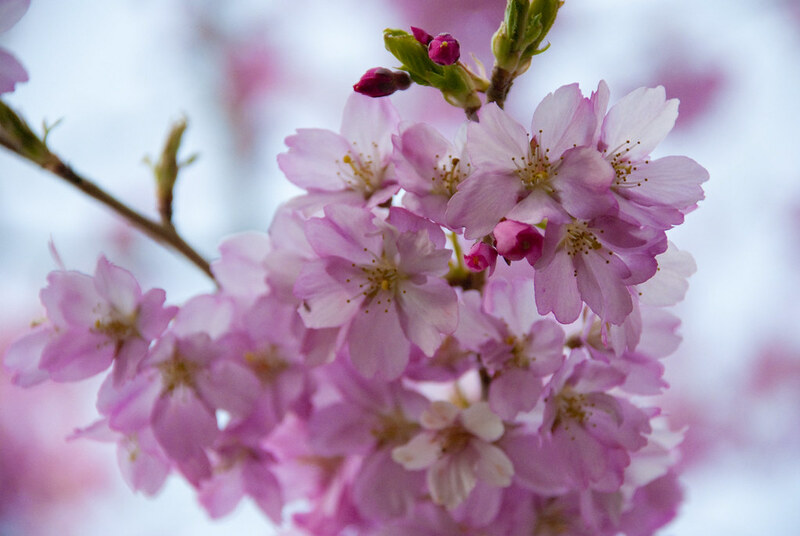 You can help the Seattle-Tacoma area win and discover nature in your backyard by logging observations of wildlife through the iNaturalist platform from April 26 – 29! Empathy in Action: Can Human Emotions Save Species? 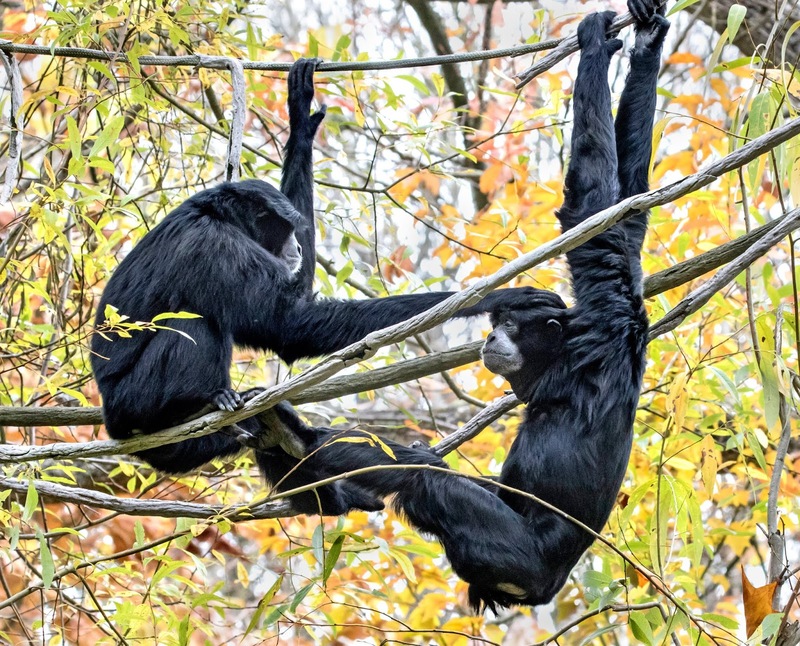 Posted by Kirsten Pisto, Communications and Laurel Abbotts, Learning and Innovation, Woodland Park Zoo. Empathy is an emotion that is very useful to coexisting with other people. In its most basic definition, empathy is an understanding of experiences or perspectives of others. Whether those ‘others’ are kids sharing the swing set with you or a fellow commuter stuck on I-5, we can all pretty much agree that empathy is an important tool to getting along with your fellow humans. But what about empathy for animals, and even more so, what about using empathy to inspire conservation action? If the opposite of apathy is empathy, surely we can harness our very human emotions to collectively take action on behalf of wildlife, ecosystems and the planet. "Woodland Park Zoo has co-created Advancing Conservation Through Empathy for Wildlife, a learning network with 19 zoos and aquariums from around the United States to study how empathy is sparked, nurtured, and ultimately how it can help people take conservation actions that benefit all of us" explains Woodland Park Zoo President and CEO Alejandro Grajal. 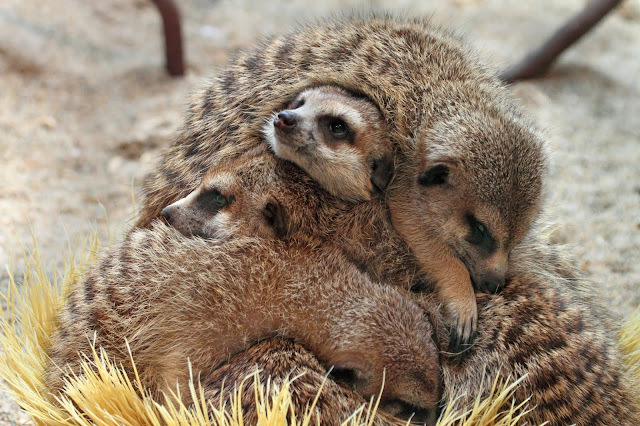 "We are in the very first stages of this research to measure and identify the ways our zoo can inspire empathy. We want to invite you with us on this journey of discovery—you can find updates on our findings and our work at www.zoo.org/empathy." To learn a bit more about this initial research, we chatted with Laurel Abbotts, who is helping lead Woodland Park Zoo in empathy research. Here’s our discussion about what might be the most exciting new thing in conservation psychology—and how your zoo is diving into this topic to save species. WPZ: You began your role as Project Manager, Empathy Project, in October, tell us about your job—were you always interested in empathy as a subject? LA: I am so excited to be part of a conservation organization and project manager of the Empathy Project, led by Wei Ying Wong PhD, the Vice President of Learning & Innovation here at the zoo. My background is in engineering and public health, so prior to my position here at the zoo, empathy was only something that I knew about as a way that people related to each other. Now I am learning about the importance of empathy and how it relates to both humans and animals and how it can inspire conservation action. Empathy staff, Laurel and Nicole visit the International Crane Foundation's build site for the new visitors' center. WPZ: You are part of an entire team of staff within Woodland Park Zoo's work to foster empathy for wildlife, tell us a bit about their role and how you work together. 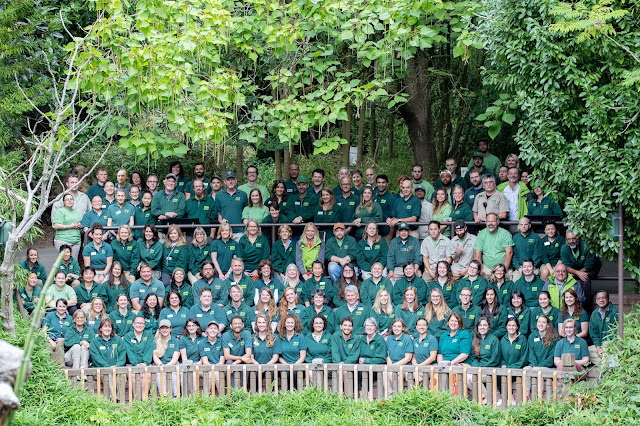 LA: Woodland Park Zoo is currently working on two multi-year grants to foster empathy for wildlife, so we have staff across the zoo working to integrate these practices into everything that we do. We also work closely with other AZA-accredited zoos and aquariums interested in bringing this work to their organizations, and we are working to build out a learning network that facilitates collaboration on both the implementation and evaluation of empathy practice. We are researching the interrelationships between animal welfare, perceptions of animal welfare, and empathy. We have designed an experimental study centered around the role of choice and control for ambassador animals and interpretive messaging in programs to better understand the effects of those programs on both the visitors and animals. 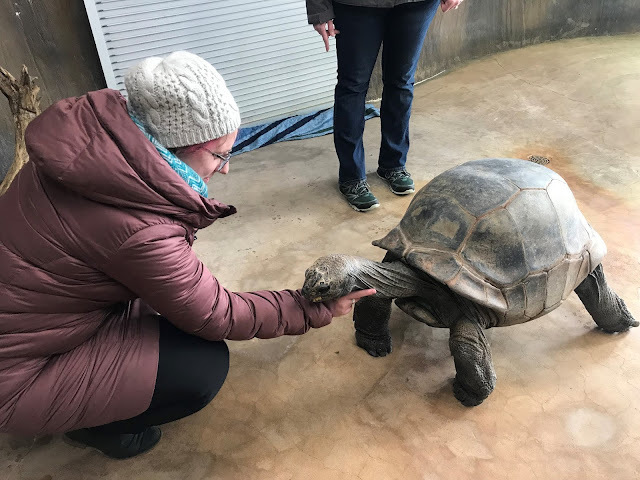 Laurel meets Tootie the tortoise at New Zoo and Adventure Park on her travels to connect with other AZA institutions on empathy and conservation action. WPZ: Tell us more abut Advancing Conservation Through Empathy (ACE) for Wildlife, the new network being facilitated by Woodland Park Zoo. LA: ACE for Wildlife is a network of zoos and aquariums focused on fostering empathy for wildlife. There is a lot more to learn about empathy, and our experience tells us that working with a network of other zoos and aquariums can help us learn and grow together. This is a topic where learning together, and capitalizing on the different strengths, audiences, and perspectives of a variety of zoos and aquariums allows us to understand so much more than if we were solely focused on one organization. 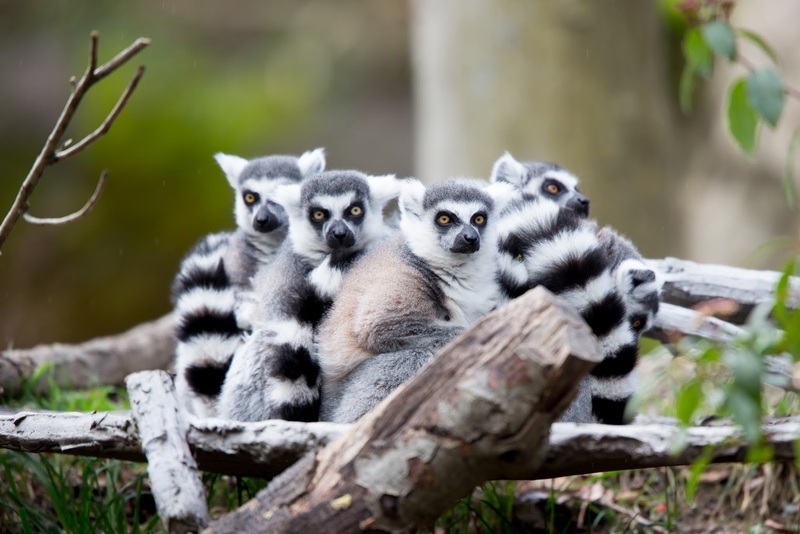 The goal of this network is to advance the knowledge and practices of fostering empathy for wildlife in zoos and aquariums and to collaborate with our peers. By building empathy for animals in our visitors and communities across the country, we are creating a social movement to inspire conservation action and protect the animals and wild spaces that we call care about. WPZ: How can empathy save wildlife? LA: A person’s motivation to take action comes from a variety of internal and external motivators. In zoos and aquariums, we often talk about a person’s connection to nature or relatedness to nature. But when we talk about empathy, we are taking this one step further. We’re not just seeking to connect to wildlife and animals, but to understand the animals that we share a planet with. Empathy is something that people develop over the course of their lives, and it is a skill that can be taught and practiced. Research suggests that increased empathy has the potential to lead to an increased likelihood that people will take compassionate or caring action. When people feel more empathetic for animals, they will be more likely to take conservation action on their behalf. To put it simply, we protect what we love, and we love what we care about. WPZ: Woodland Park Zoo recently hosted the Creating Change Symposium: How Empathy Can Advance Your Mission. Can you tell us a bit about the event? LA: The Creating Change Symposium was the kick-off event for ACE for Wildlife. It was held in Seattle over three days in January. It brought together representatives from 19 AZA-accredited zoos and aquariums from 7 states in the Western U.S., as well as 11 experts representing a span of disciplines including animal welfare, humane education, behavioral science, visual arts, and clinical and conservation psychology. Over the course of the symposium, attendees learned about foundational empathy practices, how empathy plays a role in cultural organizations of all kinds, and how empathy inspires caring action. WPZ: What was the most inspiring moment during the symposium? LA: One of the most inspiring moments for me was during a session where we learned about how fostering empathy leads to caring action. Jennie Warmouth, PhD is a second grade teacher outside of Seattle, WA. Every week, the PAWS animal shelter sends her a photo of one if their animals up for adoption. With her class, they discuss this pet, their story, and what the pet could be thinking and feeling, then write an article for the animal’s adoption. This perspective taking is especially powerful because it allows many of the kids to have a space to relate to animals, as well as process their own experiences. Dr. Warmouth and her classes have helped hundreds of dogs get adopted, and has shown the students that through their action they made a difference in the life of an animal. WPZ: Now that the symposium is over, what happens next? LA: The symposium was just the beginning of this network! This spring, we will be visiting all of the ACE for Wildlife organizations. At each site visit, we will be getting to know each organization, their goals and how they are fostering empathy in their guests and communities. By understanding their current practices and goals, we can build a learning network and resources that will help organizations collaborate, highlight their strengths, and share their knowledge with the network. WPZ: Getting to travel to meet with colleagues all over the nation sounds really amazing! What's the best thing you've experienced so far? LA: Traveling to see the different zoos and aquariums has been so cool! We spend an entire day at each site, which means we get to learn so much about all the ways that each organization is involved with their community, providing care for their animals, and supporting conservation of wild spaces. The fact that each organization is spending so much time with us demonstrates the commitment that each organization has to this work and to inspiring conservation action through fostering empathy for animals. One of my favorite experiences so far was getting to meet Aayla the Aardvark at the Henry Vilas Zoo in Madison, WI. One of her favorite foods is avocados. WPZ: How can folks at home use empathy in their own conservation actions? Provide experiences in nature and take the time to observe. Help your friends and family see or interact safely with animals and nature. This could be taking a trip to the zoo where you can learn about animals from all over the world or going to the park and talking about what you see. For instance, how are the birds in the park similar or different from yourselves? Think about animals as individuals. Even though a lot of animals may look similar, they all have unique experiences and personalities. Some dogs like to be petted by strangers while others don’t. 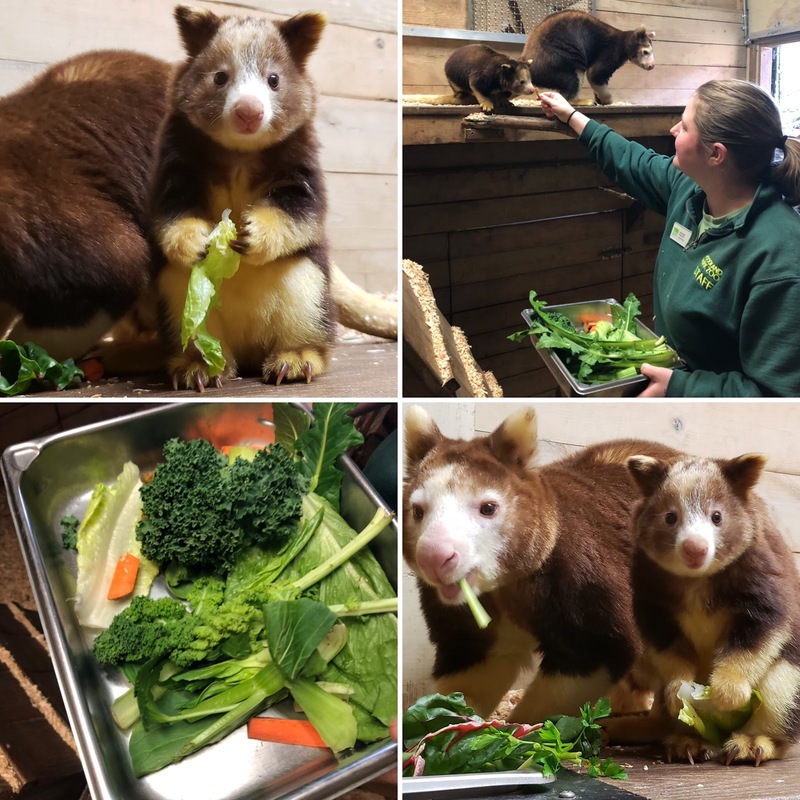 Here at the zoo, our keepers care for our animals every day, so they get to know all about their personalities and preferences, even their favorite foods! Use your imagination and take the perspective of animals, like the ones that live around you. Think about an animal like a raccoon or snake that not everybody likes. Encourage storytelling and role playing to see things from their perspective. To them, you might seem scary or dangerous, and they are learning to adapt to your environment too. You could even start with a story about someone’s favorite animal at the zoo. Learn about needs of the animals in your backyard. Once you know more about their basic needs (e.g. shelter, food, water), think about what you or your family can do to help these animals meet their needs to thrive. 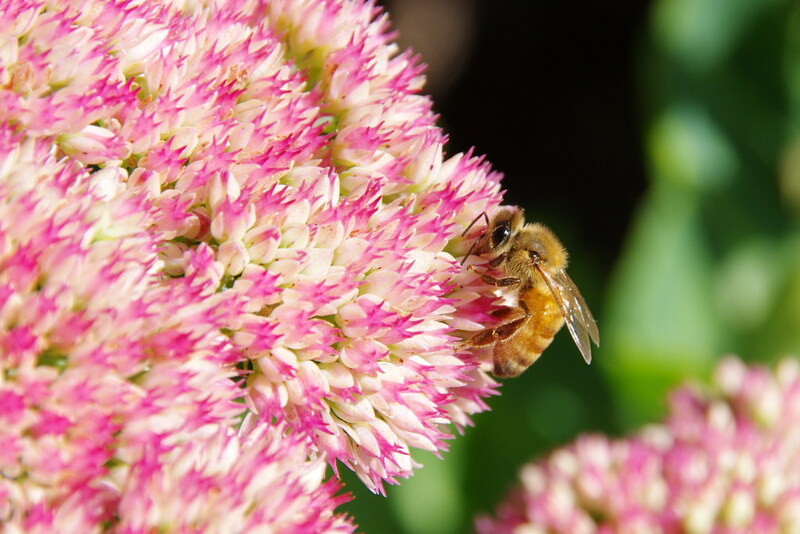 For example, build a backyard habitat for native birds or toads. WPZ: Is this your dream job? LA: I am so excited to be joining the Woodland Park Zoo for this project. The work being done on this project is fascinating to me and it empowers people to take actions on behalf of the animals who live on this planet—saving species is what it’s all about! Thank you Laurel, for sharing your work with us, and we look forward to hearing more about the Empathy Project as it evolves! Check out www.zoo.org/empathy to learn more. Illegal wildlife poaching is one of the leading threats facing endangered species. Experts estimate the sale of products harvested from endangered species (items such as tusks, pelts, horns, and body parts) on the black market to be in the billions of dollars annually. One of the most effective ways to end the bloody practice of killing endangered species is to enforce bans on wildlife trafficking. That is exactly what voters in Washington state did when they passed I-1401 in 2015 with more than 70% of the vote. Thanks to voters, our state enforcement officials at Washington Department of Fish and Wildlife have the authority to prohibit and prevent the sale of animal parts from endangered species such as elephants, rhinos, pangolins, tigers, marine turtles and others. I am proud of their efforts and those of Washington Attorney General Bob Ferguson to investigate and prosecute traffickers in our state. 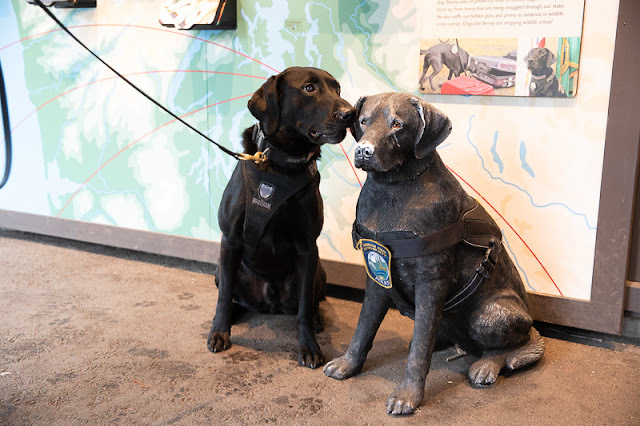 Puget Sound is home to some of the largest trading ports in the world, which makes it a ripe target for wildlife trafficking smugglers. Thanks to investigators at Washington Department of Fish and Wildlife, including specially-trained sniffer dog K9 Officer Benny, our state is working to end demand for these products and shut down illegal trafficking operations in our state. Benny sniffs out a sculpture in his honor at the wildlife trafficking display near Assam Rhino Reserve. Woodland Park Zoo is proud to partner with Washington Department of Fish and Wildlife to accept wildlife products from the community that are now illegal to sell with no questions asked. Our “Toss the Tusk” event from 10am to 2pm this Saturday, April 6th will help anyone in the midst of their spring cleaning comes upon antiques, tools, or materials made from ivory, hides, or other animal products and doesn’t know what to do with them. Woodland Park Zoo will take any items we receive and turn them over to Washington Department of Fish and Wildlife for destruction or training purposes. 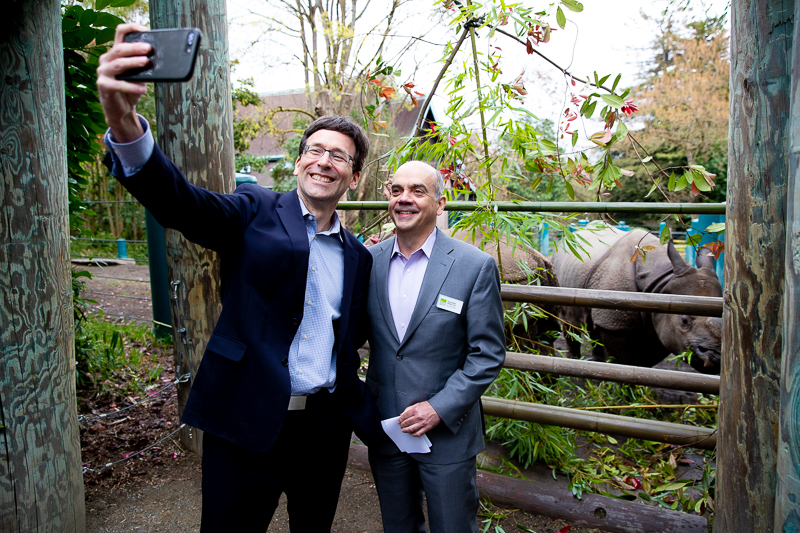 Attorney General Bob Ferguson with Woodland Park Zoo CEO Alejandro Grajal prior to the press conference on wildlife trafficking. Behind them, Taj and Glenn are enjoying a morning bamboo snack in support of saving wildlife. Thank you to everyone who is helping Woodland Park Zoo and Washington state take a stand against wildlife trafficking by ending demand for these products and enabling enforcement to stop poachers and their affiliates from killing endangered species in the wild. Join us at Toss the Tusk: Saturday, April 6, 10:00 a.m.–2:00 p.m. at the south entrance and Hippo parking lot. 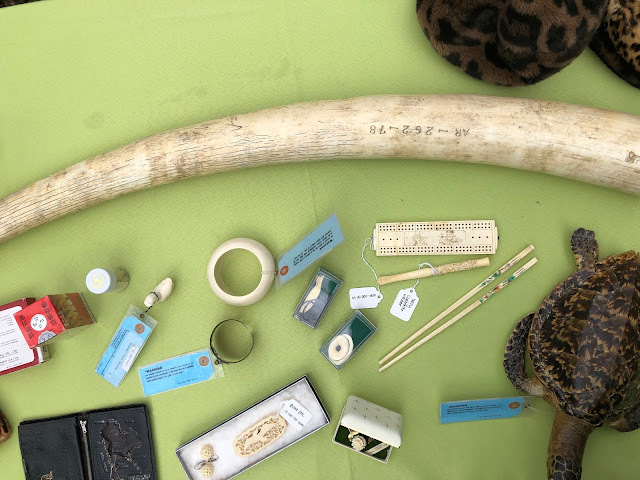 Attorney General Bob Ferguson spoke at a press conference April 3 at Woodland Park Zoo to invite the public to dispose of items made from endangered animal parts, such as trinkets shown below, illegal to sell in the state. Examples of items made from endangered animal parts were on display to educate about threats to wildlife. Laws protecting endangered wildlife work! 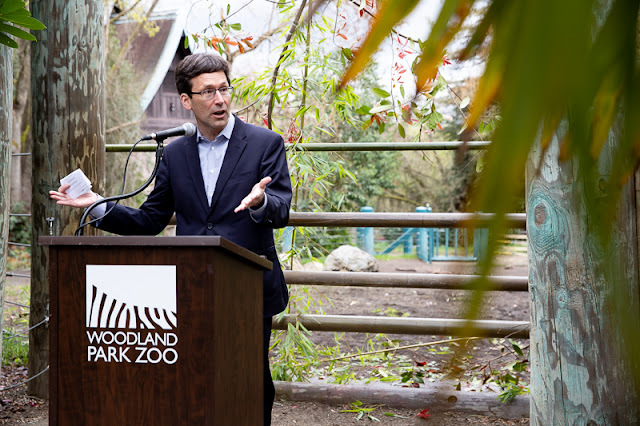 On April 2, Attorney General Bob Ferguson filed the state’s first-ever criminal charges under a voter-approved initiative banning the sale or transfer of products made from certain endangered species. Ferguson separately charged two individuals with one count each of first-degree unlawful trafficking in species threatened with extinction for allegedly selling items containing elephant ivory using online listings. Example of an item confiscated by Washington Department of Fish & Wildlife detectives. Under WATA, it is a felony to sell, purchase, trade or distribute parts of specific endangered or vulnerable species. More information about the Washington Animal Trafficking Act is available here. The billion-dollar black market trade in endangered species is propelling iconic animals towards extinction. When Washington voters took a stand against illegal wildlife trafficking by passing I-1401, they provided more than hope — they gave teeth to enforcement measures allowing us to stop this practice in our state. Ending wildlife trafficking here will have ripple effects throughout the entire world and help us save species in the wild. We applaud the Attorney General’s efforts to punish those who profit from the senseless killing of endangered animals. 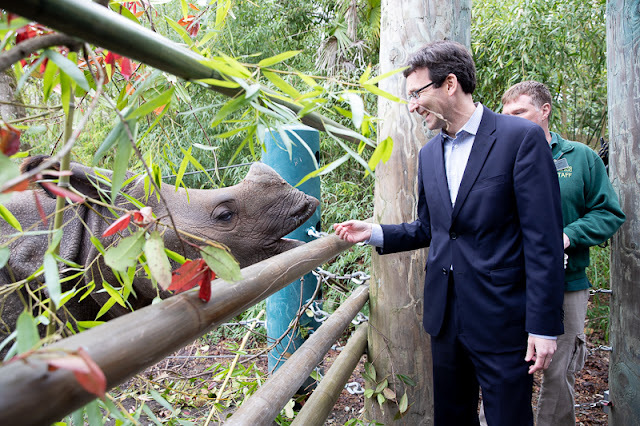 Attorney General Bob Ferguson gets up close with greater one-horned rhinos Taj and Glenn at Assam Rhino Reserve.